You're putting in time at the gym and making smart food choices. 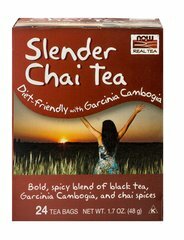 Now let's keep your drive alive with a tasty natural brew that perfectly complements your dedication - NOW Real Tea® Slender Chai. Our unique chai-infused black tea goes to work with Garcinia Cambogia, Cardamom, Ginger, Cinnamon and other herbs to create a vibrant tea that's deeply rich and flavorful. It's your diet's best friend!